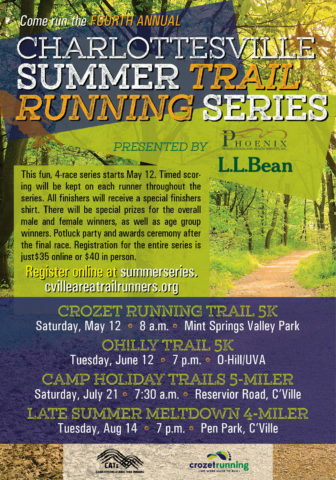 Registration is now open for the 4th Annual Charlottesville Summer Trail Running Series! $40 ($35 for current CATs Members) for 4 awesome races, 2 t-shirts and a Patagonia technical finishers shirt for those who finish the entire series, plus prizes and a ton of fun! First race is the Crozet Running Trail 5K at Mint Springs Valley Park on Saturday May 12th. Not ready yet to commit to running all 4 races? You can also register for the individual races. CAT Members login to view the $5 discount code here. ← 50K Training Program Kickoff!